NEW RATES ANNOUNCED – Compensation board chair Mark Pike delivered a new rate structure to come into effect for employers in 2017. Inset Kurt Diekmann. The Yukon Workers’ Compensation Health and Safety Board is increasing its assessment rates in 2017 to better reflect the true cost of caring for injured workers, the board of directors announced Thursday. It will also distribute $10 million in rebates among employers who have an account with the board and who aren’t in collections status. Unpaid fines and audit requests also disqualify an employer from receiving a rebate. These two measures – rebates and assessment rate changes – represent the board’s attempt to bring down the compensation fund’s surplus. Currently, it is 155 per cent funded. As per the board’s funding policy, it aims to be between 121 and 129 per cent funded. Right now the fund’s total assets are valued at $233.4 million, confirmed board spokesperson Andrew Robulack, and just under $219 million of that is in investments. 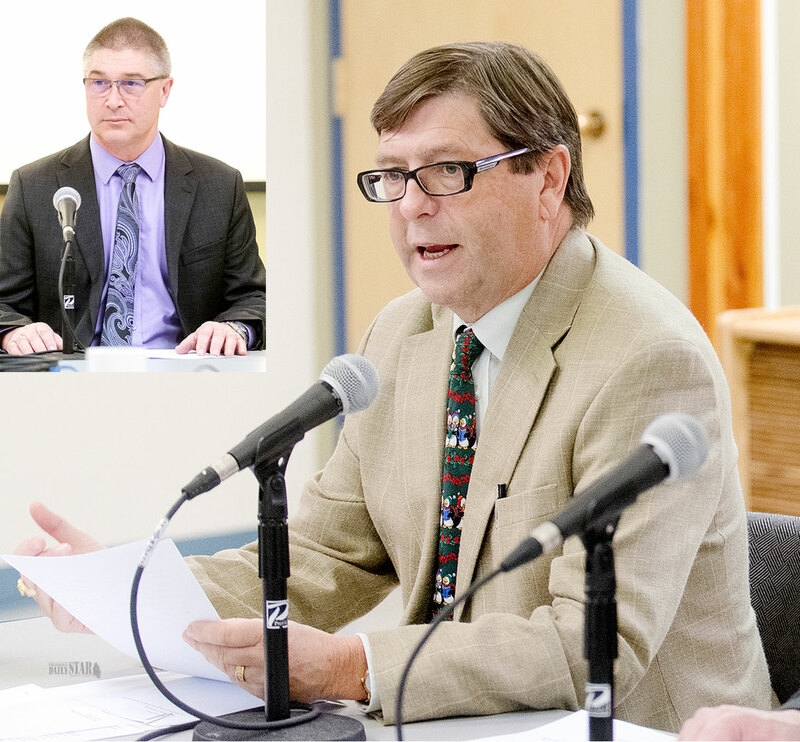 During a press conference held at the board’s offices on Strickland Street board chair Mark Pike said there is no logic to squirreling away the surplus, so it’s returning some of that money to employers through staggered rebates. After careful consideration, said board president and CEO Kurt Dieckmann, it was determined that there was minimal risk involved at present, in issuing a $10 million rebate. In 2015, the board paid out $10.2 million in rebates. The board will begin sending out this second round of rebates before the end of the year. Deickmann said it’s too early to say now, to what level these measures will bring down the surplus. He could say, however, that last year the fund was at 160 per cent, and after a $10.2-million rebate went out and rates were reduced, it came down to 155 per cent at the end of 2015. The fund is currently in a surplus position mainly for two reasons. One is that its investments performed better than expected, and the second is that there was a decrease in the cost of claims. Speaking generally to the latter, injured workers in the Yukon were returning to work more quickly, said Robulack. Since 2012, the board has been subsidizing assessment rates in an effort to reduce its surplus. In Canada, this is the most common way to bring down bring down compensation fund reserves, said Pike. “However, our strong investment performance has countered the intended effect of these subsidies,” said Pike. When employers lose sight of the true cost of workplace injuries, job safety may become a lower priority, and there may be less emphasis placed on getting people back to work after a leave, said Pike. “By returning balance to the system, employers will pay the actual costs associated with caring for injured workers and they will be directly accountable for the rates each year,” said Pike. The board hopes that employers will use this rebate to invest in workplace safety. Just under half of the 3,576 employers in the Yukon will see a rate increase in assessment rates, and not all industries will see the same increase. Indeed, rates for some industries haven’t changed or they’ve gone down. The largest rate change is in resource and transportation, specifically exploration, placer mining, reclamation, water well drilling, short haul trucking, and slashing, staking or line cutting. These sectors will see rates rise from $4.56 per $100 of payroll in 2016 to $4.79 in 2017, representing a five per cent increase. Select other resource and transportation businesses will see the same increase. The next highest increase is among certain service industries. Employers in bulk oil dealing, heavy equipment sales, nature research services, lumber yards, restaurants and catering, personal aesthetics and movies and TV, to name a few, will see their rates go up 3.6 per cent, from $1.37 to $1.42. The Yukon government, municipal and First Nations governments will each see a 2.8 per cent increase, from $1.41 to $1.45. “Despite the rate increases, almost all rate groups will still pay less than they did from the period 2009 to 2015,” said Dieckmann. The largest decrease in rates is among relatively low-risk industries. Churches, libraries, schools, childcare, and communication services, for example, will all see their rates drop 1.5 per cent, from $0.67 to $0.66. “Even though most rates are going down in 2017, they’re still much lower than they could be, that’s because of the rate subsidy,” said Dieckmann. The board set the average rate for 2017 at $1.87. The real cost, however, of preventing disability and caring for workers injured on the job next year, is about $2.30, he said. “That’s a 19 per cent gap, on average, between what it costs to care for injured workers and what employers actually pay,” said Dieckmann. Rates will continue to rise in coming years until they reflect the actual cost of caring for injured workers, he said. It’s important, said Dieckman, that rates don’t spike upward, but rather rise gradually. This rebate announcement is part of a the board’s four-year plan to bring the fund into that 121 to 129 per cent range, said Pike. This is year two, and it’s too early to confirm whether another rebate will be made next year, he added. More than $35 million in rate subsidies and rebates have been returned to Yukon employers since 2012, said the board. Since the start of 2016, there have been three workplace fatalities in the Yukon. One involved a vehicle in Haines Junction, and two others were deaths this year from diseases acquired on the job in the past, said Robulack. There have been 1,496 time loss claims for work-related injuries or illnesses in the Yukon so far this year. “We’ll know we’ve done our jobs well, as a board of directors and staff, as employers and as workers, when everyone gets home safe every day to their families, friends and loved ones,” said Dieckmann. Breaking the WCB monopoly by having a private insurance option available to workers and employers should be looked at. Competition might reduce the growing bloat at WCB. WCB needs to adjust the rates that they charge businesses. Plain and simple they are overcharging. They claim that it is their good investments. Where in this day and age are they making those kind of investments? I would like to know because I don't seem to be getting much of a return. The more money they have the more they BLOW. Look at the expansion and the new huge addition, has the work force in the Yukon increased as much as them?